Remember what this space started out to be? Well, it’s definitely looking better-wouldn’t you say?! This week, the chairs have arrived and they are done in KRAVET DENMAN CLAY and CRYPTON SKY LINEN FABRIC. Still missing the table though! Hopefully it will be here for the reveal next week…fingers crossed! We began to hang some of our clients art work, but we’re puzzled on whether we should move the buffet to the back wall as well as how we will style the buffet in the end. Looking also for a mirror to use on the walls of the dining room like this one The Parsons Round Mirror Bone Inlay from WEST ELM. And oh yes, we’re still waiting on the table to be finished. Will the table get here in time? What will it look like? So much to do in so little time! Tune in next Thursday at 7 P.M. to see what we accomplish this week in our One Room Challenge! We are finally making progress! This week (as you can see in the picture below) we’re having a bit more help- the installer and seamstress are working hard in this dining room area to create our vision. We chose the Lacefield Designs Malta Apricot for the window curtains and we sore so excited with this decision for the room. Jay is getting the job done! Why is it that we always have the bum shot of the installers?? The Esplanade Buffet from Stanley Furniture has finally arrived! Along with this amazing Linking Loops Rug from West Elm…one word, fabulous!! It’s all coming together and we cannot be more excited! 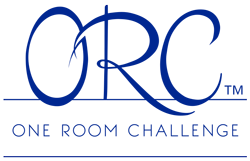 Tune in next Thursday at 7 P.M. to see what we accomplish this week in our One Room Challenge! In case you missed last weeks post you can click here to view. Welcome back everyone! 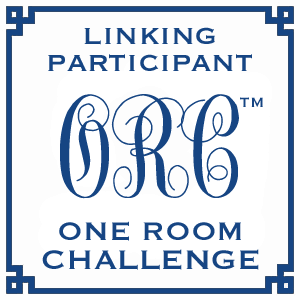 We welcome you again to our journey on the One Room Challenge Part III: Out With The Old. The chandelier from Worlds Away was installed! It’s all coming together. Our mission was to give the dining room table an update to make it as visually pleasing as possible. And what better place to get that job done than Charleston Finishing?! Specializing in top-of-the line custom finishes and antique furniture repair and giving used furniture a new life. At first, our client had wanted for us to keep the china cabinet (that was located in the corner of the dining room). But with a little bit of persuasion, and starting to see the dining room looking fresh the client elected to look at new options instead. Good furniture arrangement is the secret to making a room look its best. Yet, most people struggle with what goes where. Who among us has not stood at the doorway to a room in your home and wondered, “What’s wrong with this room?” We may sense that it is disjointed or awkward, but we’re not sure why…well every room needs something big that the eye goes to, something that gives a message of comfort and quality. In that case, our new mission was to replace the space where the china cabinet had originally been placed, and incorporate something cool, trendy, homey, and still provide the practicality of needed storage. A buffet will allow lamps and art to be featured and it will be the first thing people see when entering the front door. Make sure you stay tuned for next Thursday at 7pm and see the buffet table as well as all the other fabulous furnishings that we have picked out start to come to life! The art work that has been collected over time is the inspiration for the color scheme. The dining room is the first room you see when you walk into the house and so we are choosing a color scheme that will pull everything together. When decorating a space we like to think of the 60-30-10 rule: Divide the colors in the space into components of 60 percent of a dominant color, 30 percent of a secondary color and 10 percent of an accent color. The walls will most likely be the majority, the upholstery would represent the secondary color and accessories. The colors are properly balanced and there is a shot of color (the 10 percent color) for interest. Since the art work was very colorful we didn’t want the room to end up being “too loud” so to tone it down, we used the Aiken Ivory DCR002 from Sherwin Williams– a neutral wall paint color. We are off and running with our color scheme- using five of Lacefield Designs fabrics: Matlo Apricot, Stone Linen, Trevi Apricot, Kai Apricot, and Isla Apricot. As well as this great rug… Frost Gray Linking Loops Rug from West Elm. Stay tuned next Thursday at 7:00 p.m. to see what the Embellish girls do!